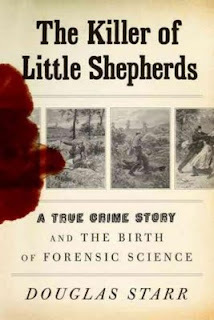 Being a fan of Bones and also a follower of shows like CSI once, The Killer of Little Shepherds is a great read. As written on the cover, it is a story about how forensic science came to be. Intriguingly enough, it is also a true crime story that took place in France somewhere in the late 19th century, where technologies were almost non-existence, and no one had heard of DNA, fingerprints, and whatever high-tech forensic stuff we see on TV today. So how were crimes particularly murders were solved then? Mostly they would bring in a suspect and force the person to admit to the crime via torture. Worse was when rumors spread, especially within rural communities, it was hard life after even if the police let you off for lack of evidence. Most of the time, these poor "suspects" had to move away and start life elsewhere. But thanks to great minds who saw how science and medicine could help in solving crimes. How autopsies, when correctly done, could determine the actual time and cause of deaths. How thorough crime scene analysis could help uncover evidences not seen by the human eye at the first glance. How a certain chemical would react and turn blue if blood existed, even after the spot had been cleaned and bleached. How profiling could help when it came to decomposed bodies beyond recognition. All these actually helped in capturing the serial killer, Joseph Vacher, nicknamed The French Ripper. He is thought to have raped, killed and mutilated at least 25 people, though he only confessed to 11 murders. And yes, the book covered the horrific details of the killings and mutilations that I gasped in horror when reading those chapters. He even tried to claim insanity to escape justice. And really, how can one who were capable of such despicable acts not be mad? However, does that mean he can thus escape punishment? We wonder why such crimes exist in humanity and what pushed them to be such "monsters". There are many theories; one of which is that these people were born to be criminals. Another being the environment and living situations that made them who they are. But will we ever really know the real why? Overall, it is very well-written and keeps the reader turning pages. Definitely one of the most thrilling lesson in history that won't have you dozing off.